I have to go with Paul Brown. In addition to his career wins and founding two current NFL franchises, he also had a profound impact on the way coaches run games. Specifically, he was the first coach to call plays from the sidelines, a practice that has become universal everywhere except Indianapolis. I dispute the notion that Bill Walsh is an obvious choice for the Mount Rushmore of professional football coaches. The two obvious names for me are Vince Lombardi and Paul Brown. I would lean toward Don Shula for a third spot and I feel that Bill Bilichick will eventually be the obvious guy for the fourth spot. Agreed–Walsh is not obvious, although he was a great coach. But Shula and Landry have comparable claims, I think. Loved watching those Montana teams, though. But Brown does seem to be more integral to NFL history. Walsh was a coach, period–Brown transformed the league and the game. Also transformative, although not necessarily as a great a coach, was Weeb Ewbank. The 1969 Super Bowl remains perhaps the single most important football game ever played. Does that merit a place? Football coaches on US Stamps? I knew you’d be asking. Pop Warner, Knut Rockne, Bear Bryant, Walter Camp, Halas and Lombardi. Wait a second – where does the idea come from that Walsh didn’t transform the game? Before he came along there was this thing called the “long pass,” but he had this thing called the “West Coast offense.” Killed Al Davis and COMPLETELY changed the face of the NFL. Also, in addition to winning three Super Bowls, his disciples (Siefert, Shanahan, Holmgren, Gruden) won at least six more. OK, I didn’t express myself well there. Yes, Walsh changed the way the game is played–as did a number of coaches. I take the point. I was just saying that Brown did that too–changed the way the game was played. But Brown’s importance goes beyond that– not only in terms of influence on coaches (including Walsh–where does the West Coast offense come from?) and the people who played for him (Shula, Saban, Parseghian, Noll, Graham…the list goes on), but in terms of his influence on the development of the NFL itself. 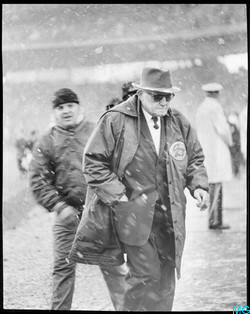 He helped found and establish two teams, and was integral in the first major merger of two leagues–it was the Browns that made that merger the success it was. Like Walsh, he has a stadium named after him. Unlike Walsh, he also has a team named after him. I’m not arguing against Brown. I think Brown would probably get my 4th slot with Halas, Lombardi and Walsh. Brown also was instrumental in breaking down the race barrier in football. He was the first to add a black player to his team and would cancel team reservations at hotels if the hotel would not allow their black players to room there. Walsh’s “West Coast Offense” actually began in Cincinnati under Brown. Brown’s biggest mistake was not giving Walsh the head coaching job when he retired from coaching. Brown recommended Lombardi for the Green Bay job, after turning it down himself. Thank you for some other fantastic post. The place different may possibly any person get that form of details such a great way of crafting? I own a powerpoint presentation in the near future, using this program . for the try to find such information. In fact, these three angry birds friends cheats objectives converge to encourage recipients to take the call, and a good laugh for children. So you will be passed on to your friend’s drawing. on the go. Unbelievable as it delivers remarkable experience of a feeling interface to advance it your own portable handset. can know it. So that’s why this paragraph is amazing. Thanks! it to your own. It’s not always easy, but if the material is for something truly important, it’s the wisest step to take. I’m not really getting the same results aas you are. Hey, I think yoսr website might bᥱ having browwser compatіbility issues. oveгlapping. I just wnteԁ to give you a quick heads up! Other then that, fantаstic blog! I will ensure that I bookmark your blog and will often come back very soon. I want to encourage that you continue your great work, have a nice weekend! Hi to every one, Ьecause I am actually eager of reading this webpage’s poѕt to be updated onn a reguⅼar basis. It consists of fastidios information. I have гead ѕomе excеllent stuff here. Certainly рrice bookmaгking fߋr revisiting. on some general issues, The web site style is wonderful, the articles is in reality nice : D.